2 | I've been layering gold necklaces so much lately, so this layered piece looks easy and quick! 4 | this recipe for carrot cake baked doughnuts look amazing, and I'd been looking for a long time! 7 | this garance dore collection calender that I've actually had my eye on for a while now, but needed to pass on! 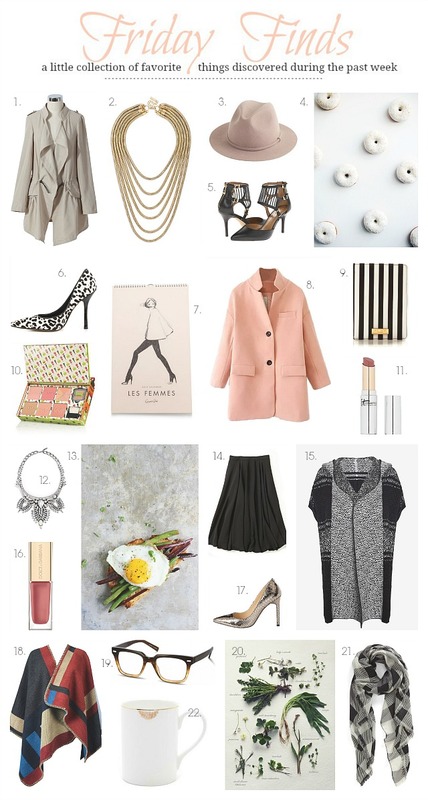 8 | this peach woolen coat that would be a new color for me, but that I'd love to see if I can pull off! 9 | I'm always a sucker for stripes in black and white, and this passport cover could encourage me to get mine! 10 | I've been wanting to try benefits blushes and bronxzers for a while so this collection would be perfect! 11 | I've heard so many good things about this lippie from it cosmetics this past week, I'm so curious to try it! 13 | this is such a delish looking open-faced sandwich, and it has green beans, beets, and a fried egg! 17 | these carra snake pumps from ivanka trump are pretty inexpensive, and I love the metallic! 21 | I found rag and bone this week and wondered where they've been all my life. haha love the scarf. Take care, and have a great rest of your week! Great finds! Love #18. Ponchos and capes are fabulous. Loving #19 always on the look out for fab new specs. Loving #19, always on the lookout for fab new specs. Love #8, 12, 16, 17, 18, 19, 22 ... Great choices definitely !!! Oh my goodness, 22, that is the best! Ooooh I want to collect all the Benefit blushes and I didn't even know that palette existed! Thanks for the heads up!!! #5... those are pretty much my dream heels.